In This With You points to wise next steps for people struggling after an abortion or in crisis pregnancy situation while giving their friends practical ways to love and support them. Statistically, about 1 in 3 of your friends (girls and guys) will have an abortion story in their lifetime and 1 in 2 of your friends will experience an unplanned pregnancy at some point. Often your friends navigate these circumstances in isolation without letting you know because of shame, fear of judgment, and stigma. But if you knew your friends were struggling in these circumstances, wouldn’t you want them to not be afraid and reach out? Here’s how you can let them know! By completing the 3 Steps below, you can preemptively offer your safe friendship (that is, “raise your banner”) to those you love who might be silently struggling in a crisis pregnancy or from a past abortion either now or in the future. 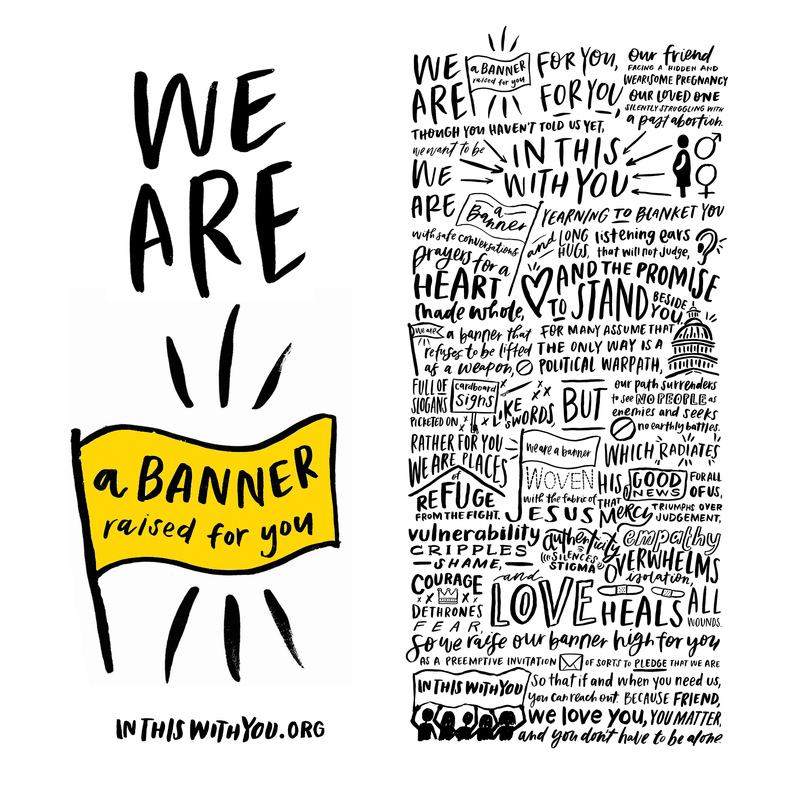 ITWY’s “We Are A Banner” manifesto is a declaration of the movement’s heart and purpose. By signing it, you’re declaring you’re in the ITWY family! We are a banner raised for you. For you, our friend facing a hidden and wearisome pregnancy. For you, our loved one silently struggling with a past abortion. We want to be in this with you. And the promise to stand beside you. But our path surrenders to see no people as enemies and seeks no earthly battles. Rather for you we are places of refuge from the fight. And love heals all wounds. To pledge that we are in this with you. And you don’t have to be alone. The desire to help your friends is important, but you also need wisdom on what to do and what not to do! Read through the following two documents to prepare yourself for how best to help your friend. You have friends that need to know that you are a safe person to open to. You also have friends that would love to join the movement but don’t know about it yet! Complete the three actions below to “raise your banner” and let them know! follow… Join ITWY on Social Media!